Ahoy – do ye spy that on the horizon, mateys? It be a bounty of NEW ITEMS! 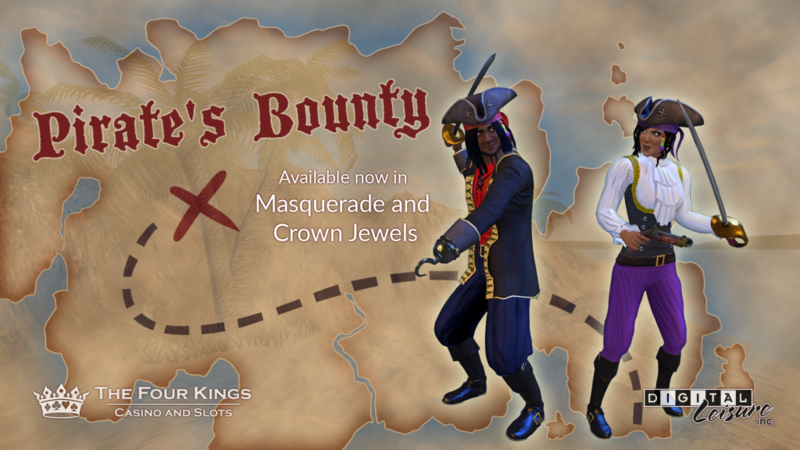 Get ready to sail the high seas with the Pirate’s Bounty costume pack! 5 items are available now at The Crown Jewels, including the Eyepatch, Flintlock, and Cutlass. Complete the set with 7 more items available at Masquerade, including a fearsome Braided Beard and enchanted Siren Makeup to finish the look of any aspiring pirate or piratess! Don’t be a scurvy landlubber – collect all 12 items! Holiday 2018 – 12 Days of Four Kings!